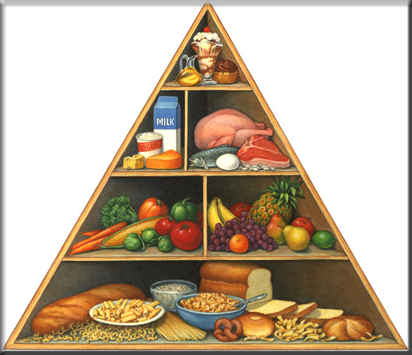 A picture that represents a balance and healthy diet by placing food groups in a pyramid according to the number of servings from each group to be eaten every day. Food pyramid can help you achieve balance diet through showing you different groups of foods and and their required amounts on a daily basis, following the food pyramid you can easily maintain weight and increase weight loss. Before following food pyramid you must know what is serving? Serving size is the amount of a food or drink that is generally served. If you eat a larger portion, count it as more than one serving. For example, 1/2 cup of cooked pasta counts as one serving in the bread, cereal, rice and pasta group. If you eat one cup of pasta, that would be two servings. If you eat a smaller portion, count it as part of a serving. Group1 – This first group contains breads, cereals, pasta, and rice . Six to eleven servings of carbohydrates is recommended daily. Group 2 – Group two contains two subgroups fruits and vegetables. Include 3-5 servings of vegetables, and 2 to 4 daily servings of fruits daily in your diet as we know these are the best sources of vitamins. Group 3 –This group include, the protein foods. Eat 2 to 3 servings of protein, which includes meat, milk, eggs and nuts daily. Group 4 – This group contains fats, oils and sweets. Use sugars and fats sparingly.